T he Solar Reflections is sold only by Hypnartic Artwork. T his sculpture is equipped with a heavy duty cast iron anchor. As the mood of the sky changes this stunning"Estate Quality" sculpture by Hypnartic Artwork will provide a continual mosaic of textures and colors creating a truly unique visual experience. 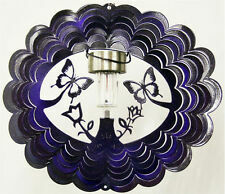 PURPLE BUTTERFLY SOLAR LIGHT WIND SPINNER. 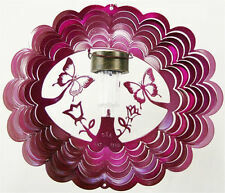 LIGHT UP YOUR GARDEN WITH OUR NEW SOLAR LIGHT WIND SPINNERS! Don't forget wind spinners make GREAT GIFTS! Brightest & Most Reflective Wind Spinners on the Market. 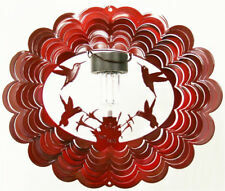 RED HUMMINGBIRD SOLAR LIGHT WIND SPINNER. LIGHT UP YOUR GARDEN WITH OUR NEW SOLAR LIGHT WIND SPINNERS! Don't forget wind spinners make GREAT GIFTS! Brightest & Most Reflective Wind Spinners on the Market. LIGHT UP YOUR GARDEN WITH OUR NEW SOLAR LIGHT WIND SPINNERS! Don't forget wind spinners make GREAT GIFTS! Brightest & Most Reflective Wind Spinners on the Market. Makes the perfect gift! SET OF TWO (2). Features interior ON/OFF switch for convenience. When in the "ON" position, LEDs automatically illuminate at dusk. Weatherproof & Durable - Wind Spinner Sculptures made from rust-resistant stainless steel. And these lights will automatically turn on at night. Light Sensor - The light turns on automatically for illuminating house number after sun set. Aluminium - 4pcs LED light inside Aluminium construction. Trending at C $41.70eBay determines this price through a machine-learned model of the product's sale prices within the last 90 days. Stainless steel stake. Solar powered. Colour changing LED. Stylish, modern garden lighting ideal for patios, paths, borders and driveways. 1 x AA rechargaeble battery included.